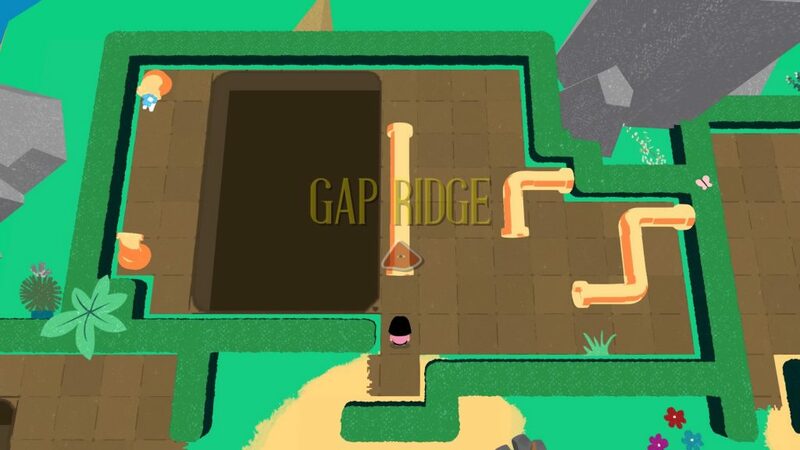 Pipe Push Paradise, to quote its own blurb, is a difficult open world puzzle game about plumbing. Right, review done. See y’all. Only kidding. It’s a puzzle game where you have a variety of puzzles of varying difficulty interspersed around a central hub area. 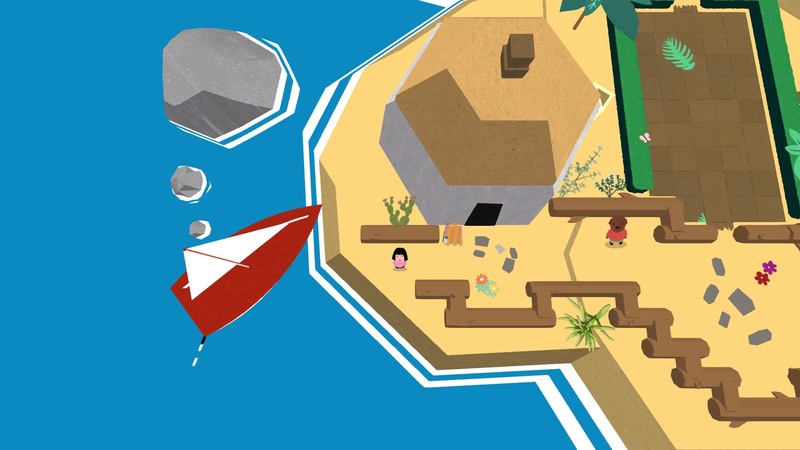 It’s clearly a labour of love by solo developer Corey Martin who’s curated this challenging puzzler. Each unlocked section can be quickly navigated around by selecting the campfire in the respective region. It’s a cute nod to Dark Souls but mechanically unnecessary as the world itself is made up of forty seven distinct puzzles. This might seem slight at first glance, but this is a game with hidden depths. 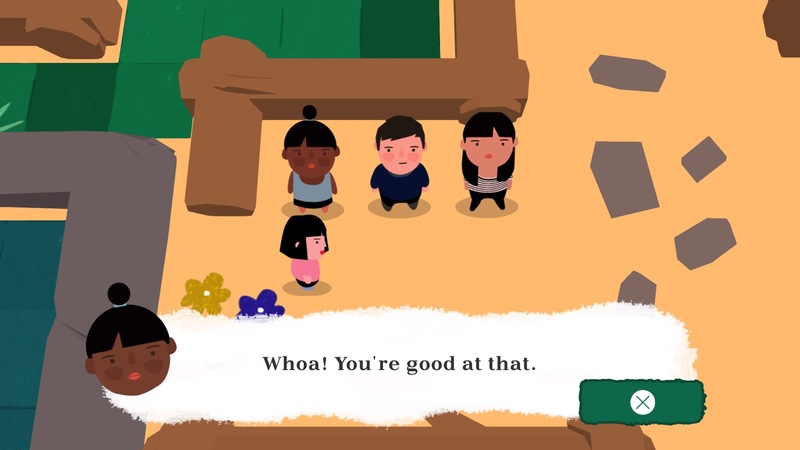 You’ll start with easy puzzles but soon find yourself battling headscratchers you’ll be genuinely baffled by. You’ll initially begrudge them, moving on swiftly to lower hanging fruit and easier puzzles. Eventually you’ll get to a point you can’t progress past and you’ll come to realise that perhaps doing the puzzles in order is the way to play this game. The gameplay isn’t too dissimilar to the likes of classic videogame Sokoban, except in this case you’re pushing pipes around instead of boxes in a warehouse environment. Pipes aren’t just on a flat plane though, being as they are 3D objects. You’ll soon get a feel for how the pipes react to how you push them, pivoting according to where you make contact. One fundamental holds true throughout. If you obscure a side against a wall, you’ve generally lost the ability to push that pipe away from that surface. You’re unable to pull items away from a wall once they’re stuck. It really curtails your ability to move around, but it does mean once you do solve a puzzle you wonder how you made such hard work of it on the previous tries. Maddeningly you’ll reach a pipe configuration you’ve not managed before on a puzzle and think you’ve had a eureka moment, elation building until you realise you’re still stuck. One particular example being named Axis Denied. We managed more through luck than judgement to nail the other puzzles in the area but this one vexed us more than we’d like to admit. Often a little lateral thinking is what’s needed, your fixation on a getting a particular layout means you’ll miss and answer hidden in plain sight. You can restart puzzles with a quick tap of but you’ll probably step back a move with instead. 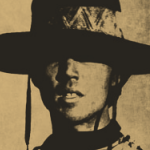 You can go back a long way by holding the button down, in our case to a point where we realise we’ve reached a point of not having royally fudged an attempt. Recognising the pivotal placement is often the key to a tricky level, everything dropping into place after that. Resist the temptation to look for video walkthrough guides as you’ll be depriving yourself of the dopamine rush when you finally nail a particularly tricky puzzle. It’s not too dissimilar to the feeling this reviewer got when beating a particularly tricky Portal 2 level. 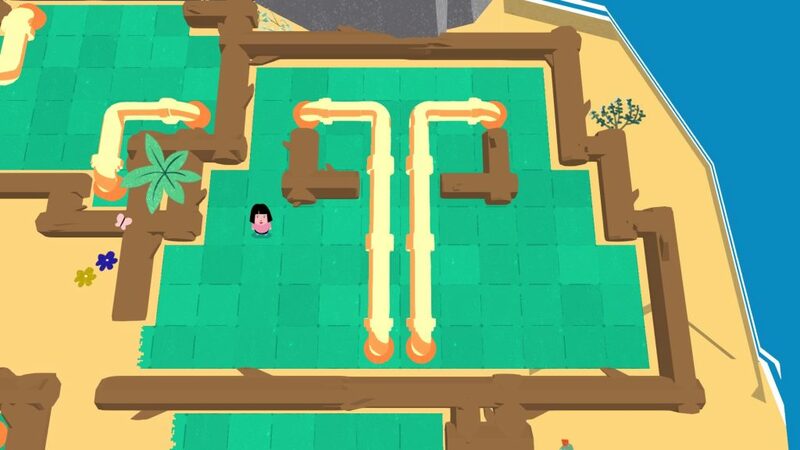 Later puzzles add chasms you have to traverse, usually by using sacrificial pipes to get across otherwise impassable games. Further levels add the complication of magnetic pipes that stick together, the first of which being the sticking point we mentioned earlier. The minimalist audio of waves splashing and Spanish flamenco-style guitar combine well with the relaxed vibe, the naive style artwork also being contributed by the musician plucking on strings as you while away the hours. Though we confess that we got stumped after twenty three puzzles and need a break but trust us, we’re hopelessly addicted and it’s almost one in the morning yet again. 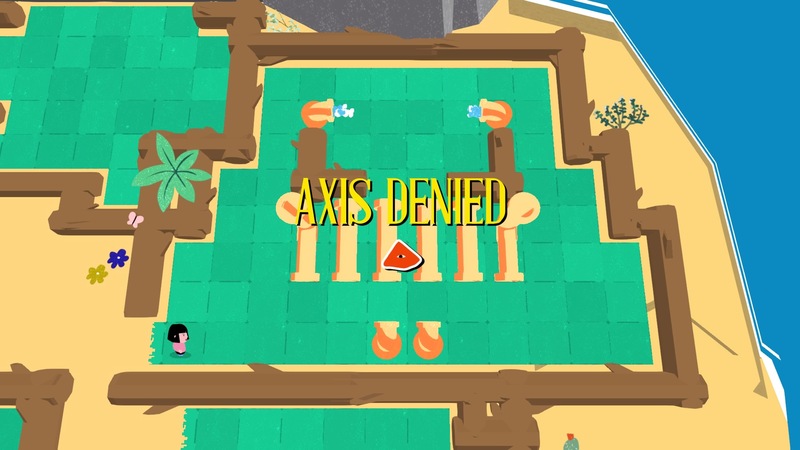 If there’s any negatives to be drawn from Pipe Push Paradise, it often feels like there’s only a single arbitrary solution to some levels. One wrong move and you’ll find yourself backing up or restarting an attempt. Also, our initially impatient approach seems like it has caused some trophies to glitch and not unlock. Hopefully a post-release patch will fix this, as we don’t relish having to replay some of the harder challenges again. Or perhaps the game is working as it should, we’re just expecting trophies to come quicker than the dev intended. In conclusion though, PPP is a simple concept that’s been well fleshed out. Perhaps too cerebral for some but for this reviewer at least, a perfect way to spend a few hours. This reviewer lay in bed last night thinking of our next approach on one level. If that’s not a mark of a good game getting under your skin we don’t know what is. + 47 puzzles might seem slight. It isn’t. A challenging slow burner of a puzzle game that you'll end up being hopelessly addicted to.